After hosting a team of short-term missionaries in December 2011, we had the joy and sorrow of seeing our short-term missionaries, James Stafford, Vanessa Rubingh, and Rachel Knight, head back to the U.S. I say sorrow, because we hated to see such good helpers go, and joy, because of the work that they had done. The team not only invited many families to send their children to the VBS programs, but they taught VBS in two different locations during the week—in Mandubí in the morning and in Santa Isabel in the afternoon. 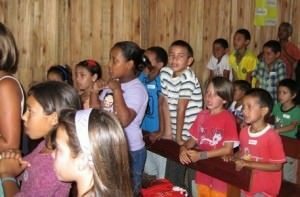 They also made presentations to the young people of the central church and Santa Isabel, visited with families in the church, taught piano, and, when VBS was done, visited with all of the families of the children who had come to the VBS there. I get tired just thinking about all the work they did! And the Lord, in His mercy, saw fit to greatly bless their labors. On Christmas Day, there were about eighty kids in the Sunday school in Mandubí, the most ever. The team is talking about returning in June or July ("wintertime" here in Uruguay), so please pray for their studies, for their walk with the Lord and growth in grace, and for their possible return. And, please pray that the work that they have done would have permanent effects in the lives of the people with whom they ministered.